Conan then and now: he'll start hosting Tonight on June 1st. Note to readers: Not everyone panned Conan O'Brien's Sept. 13, 1993 debut as host of NBC's Late Night. As proof, here's your friendly content provider's original review of his opening night. The reference to "Chevy" is Chevy Chase's then new latenight show for Fox, which got off to a disastrous start earlier in September and was gone by mid-October. And I do plead guilty to not thinking much of Andy Richter at first. O'Brien will take over The Tonight Show on Monday, June 1st after appearing as Jay Leno's last guest on the preceding Friday. This article was first published on Sept. 15, 1993. If you've seen Chevy, you'll like Conan. Faint praise perhaps, but the new kid on the late-night chopping block pretty much kept his head on Monday's premiere of NBC's Late Night with Conan O'Brien. Plucked from the ranks of the absolutely, positively, totally unknown, O'Brien survived opening night with help from much-better-knowns John Goodman and Tony Randall. Goodman gamely wore a "First Guest" medallion and leg-wrestled with George Wendt. Near show's end, Randall arrived stern-faced and smug in a silly-looking tux. He critiqued what he had seen before Conan interjected, "You're not amused by me at all, are you?" 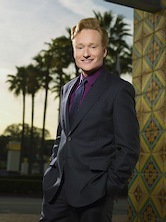 On the contrary, Randall said he was tickled by Conan's dark blue "bar mitzvah suit." He later joined the host in singing "Edelweiss" as a lullaby to insomniacs. Some of this worked quite well. NBC's strategy has been to lower expectations to the point that O'Brien would succeed if he weren't incontinent during his first show. The new Late Night began with a taped segment in which Conan happily greeted the day and jauntily strode through downtown New York to NBC studios. "Hey, you'd be better be as good as Letterman," a florist brayed. "I'll give it a shot," said Conan, letting a smile be his umbrella despite mounting choruses of "Better be good" and "Lotta pressure." The ubiquitous Tom Brokaw, who also appeared on CBS' first Late Show with David Letterman, told Conan he'd like to be the first to welcome him to NBC. Just one more thing, though. "You'd better be as good as Letterman -- or else," said Tom, fixing Conan with a steely glare before crunching a cracker in his hand and blowing it in the new kid's face. It was a clever beginning to a show that failed to be as bad as many expected. Conan finally emerged onstage to a prototype ovation. Reasonably poised, he was armed with at least one killer one-liner. His naysaying boyhood friends had told him, "O'Brien, the day you get your own talk show is the day there's peace in the Middle East." Once behind a desk, he welcomed cherubic sidekick Andy Richter, whom he probably should de-welcome. His questioning of Goodman -- "How's it going?" he asked twice -- raised immediate questions about his interviewing skills. Second guest Drew Barrymore, whisked in from filming a "female Western" in Bracketville, Texas, wore a smashing dress but didn't wear too well otherwise. Randall's cheekiness arrived just in time, though. And when all was said and sung, Late Night with Conan O'Brien flashed enough promise and panache to merit guarded optimism from a previously scared-silly NBC.